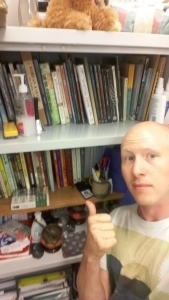 books, DVDs and other materials. 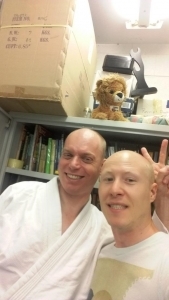 The collection ranges from manuals on Aikido as well as other martial arts, biographies, humorous memoirs (Angry White Pyjamas!!!) and even samurai films. 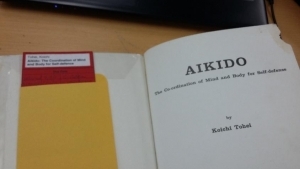 Not to mention material related to the martial traditions of Japan in general. I find there is generally something there for everyone. If you’re not sure, just come and ask me! These materials are located on the top 3 shelves of the metal cupboard in the Nathan dojo. 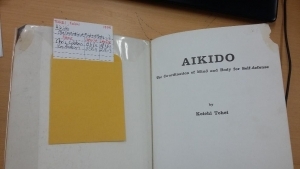 We are very lucky as an organisation to have all these materials and as you go through your Aikido journey, a good book may be inspirational or even insightful along the way. We welcome you to peruse and borrow items that will prove invaluable to you in your training. From time to time, you may also find new items added. So do take a look every now and then. However, in order for me and others to keep track of all these amazing materials, there are some rules members must follow in order to use the dojo library. 1. Only members that have a coloured belt may use the library (however, if you ask a senior committee member, considerations may be made for you). This is a tricky one. When borrowing an item, you must pull out the white card, fill in your name and the date you have taken it. 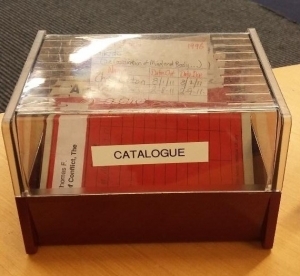 Then, in the catalogue box (which is near the books) place the item’s white card standing up in the box, and take the item’s matching red card and place it inside your borrowed item. Make sure the right card is in the right book as well. When returning your items make sure you fill in on the item’s RED CARD the date it was taken and returned. 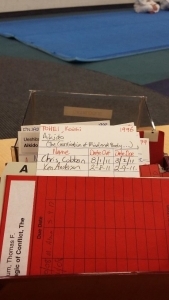 Then replace the white card with the red one back into the catalogue box. Place your white card back into the item you borrowed. 4. When borrowing an item, you must return it within 6 months. 5. Generally, you should have no more than one item at a time. So those are the rules to using the library. By following them, you ensure that I and other committee members can easily keep track of who has what items. This means I can spend more time on the mat training.